A new study out this week had a curious twist on what might cause dementia, the elderly epidemic of gargantuan proportions. It turns out that a highway close to your house may be related. Which brings up my Mom, who’s with us right now and who has a significant short-term memory issue. While her repeated questions can drive me a little batty, my wife, ever the one to notice the collateral beauty in everything has a great technique that she calls “Groundhog Day.” It’s such a great idea for burnt out caregivers of Alzheimer’s patients that I thought I’d share her technique this morning. More than 5 million Americans have dementia and the rates have been rising. There are many theories as to why this is happening, but one put forward this week is fascinating. A busy road may well be one cause. The new study tested the theory that toxins from car exhaust could have something to do with our dementia epidemic. The researchers looked at 2.2 million people who were part of a government funded Alzheimer’s disease study. They recorded their address and it’s distance to a highway 5 years before the inception of the research and then performed complex statistics to find if there was a correlation to the development of dementia, Parkinson’s disease, and Multiple Sclerosis. They found a direct correlation between the distance to the highway and development of Alzheimer’s dementia, but not the other diseases. The closer one lived to heavy traffic, the greater the likelihood of having dementia. My 88 year old mother has dementia. She’ll ask the same question a good 10-20 times over an hour. It can fry my nerves a bit, but my wife has figured out how to deal with it with grace. 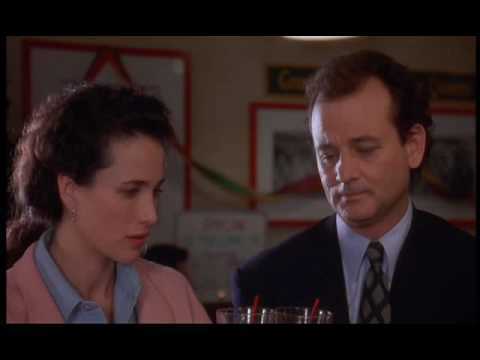 The movie Groundhog Day (see clip) is a classic illustration of what physicists call the multiverse. Believe it or not, they now believe that we live in infinite side by side universes and that every decision we make creates a new one. So there is a “you” who got that cup of Starbucks this morning and an alternate “you” who didn’t go to Starbucks who lives in an alternate universe. Bill Murray is a Television Weather guy who awakes one day while covering the Ground Hog day event to realize that he’s living the same day over and over. After having some crazy fun with it, he eventually gets depressed and tries to off himself, only to wake up every morning beginning the same day again. Bill ultimately realizes that he’s been given a great gift to perfect himself and get the life (and girl) he wants. So with each new repeated day, he’s able to get just a little better as a person. Caregivers of patients with Alzheimer’s disease can get easily burnt out because of the constant repetition of information. My wife’s new technique is to consider every interaction with my mom like Groundhog day, a chance to answer the same question differently and observe the results. It keeps her able to be in the moment with my mom instead of getting frustrated. It occurred to me last week that this technique may help a lot of caregivers struggling with dementia burnout. The upshot? Some dementia may be linked to the toxins our cars produce. Also, if you’re struggling to keep sane while caring for a loved one with dementia, watch the movie Groundhog day and use dementia as a wonderful way to see what life would be like if we all had unlimited do-overs! Wonderful advise and delightful clip from one of the classic movies. If someone asks "When are we going out? ", you can say, 1. "We're going out after lunch. ", 2. "We're going out at about 3. ", 3. "We're going out once I pick the kids up from school. ", 4. "We're going out a few hours before dinner. "., 5. "We're going to go out after I get what I need for dinner...what would I need to make your famous Cowboy stew the boys always loved? ", etc. All answer the question, just dfferently. Someone with dementia doesn't encode things effectively anymore. Memories already filed are vivid and they can likely tell you where in the house their bedroom was growing up, and who their first grade teacher was, but they have no idea they just asked that question 5 minutes ago. Answering the question differently stimulates different "files" and gives you an opportunity to see what lights them up, and, helps the care-giver to not lose patience, as it turns the 11th time into a new experience for the care-giver as well! Can stem cells be used to help dementia? Does Regenexx get involved with that? Fabulous article, and what a great twist on answering the same questions over and over! I'm going to try that with my 6-year-old. Thanks for sharing this great mind preserving perspective. How fortunate the Centeno's are to have your mom for 88 years. I promise you will cherish the opportunities she is giving you now when she finishes her life, and your memories of her will become even more cherished. Thanks Dom. We are very, very thankful! She's a retired RN, and loves being at the Clinic. Wishing you and your wife well!